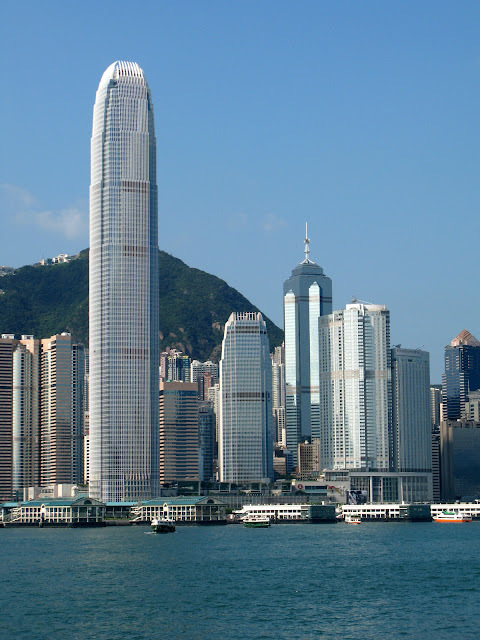 Supertall buildings seem to get a bad rap in most cities, apart from New York, Chicago and anywhere in China. Ok, so they aren't always appropriate. Placing something 2000 feet tall like the Burj Khalifa in San Francisco - I would oppose due to being so way out of scale with the rest of downtown. So what would the Pyramid have looked like if it were built to 1,150 feet. Images of the design are very scarce apart from one shown on SF Gate (see black and white image below). 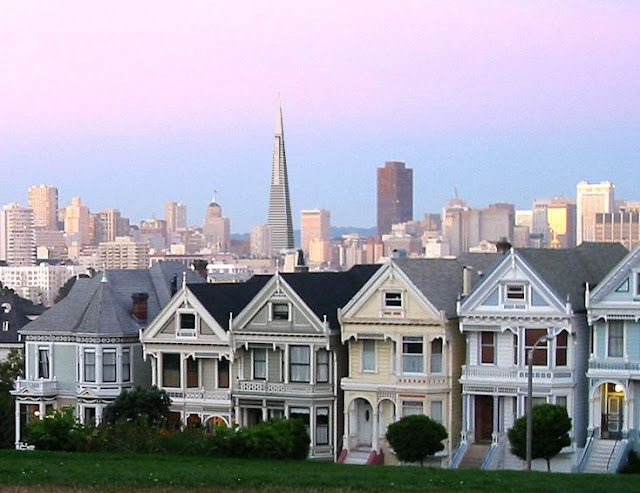 So using my crude Photoshop skills I made an image of what it might look like from Alamo Square. The second image shows what the pyramid's original design looked like. 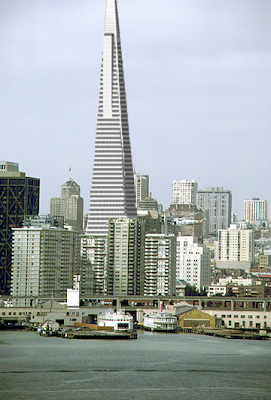 Transamerica Pyramid if it were its proposed height. Image "adjusted" from SF Cityscape original. Based on the view from Alamo Square it doesn't look so bad from what I see. Sure it would have been MUCH taller than anything else, and probably a bit out of context. However, the pyramid shape does indeed reduce the impact, and would have been more graceful with steeper pyramid sides due to the taller height. 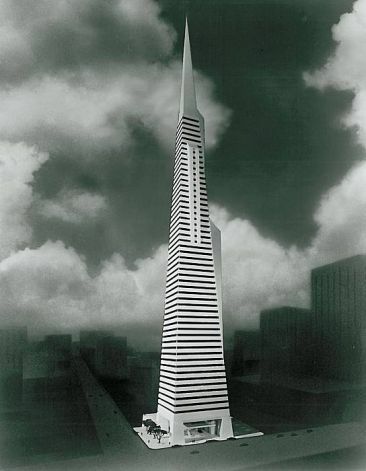 Height of originally proposed Transamerica Pyramid as seen from bay (and with Embarcadero Freeway). 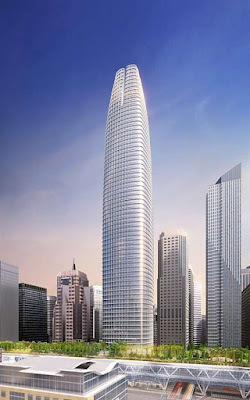 More on the Transbay Tower, Towering Inferno and images after the break. The original Transamerica Pyramid was to rise 1,150 feet, only 50 feet shorter than 1,200 foot proposed height of the Transbay Tower. The Pyramid was only built to 850 feet, while the Obelisk will be built to 1,070 feet. It is interesting to note that the proposed Pyramid would have been taller than the currently planned Obelisk, by 80 feet. Both have had their designs adjusted and heights reduced by over 100 feet. 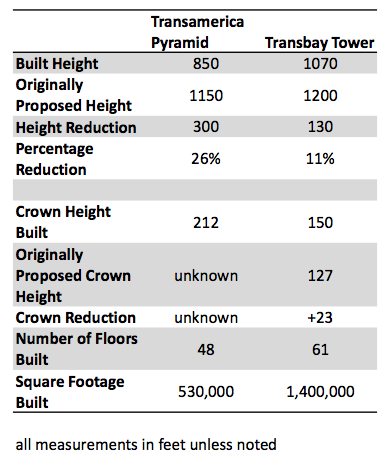 Seeing as the Transbay Tower, er Obelisk, has only been reduced 11% compared to Pyramid's 26% reduction, maybe San Francisco has warmed up to taller buildings. Below is a chart looking at their differences and similarities including their height reductions. Original proposed Transbay Tower in SF skyline from Treasure Island. 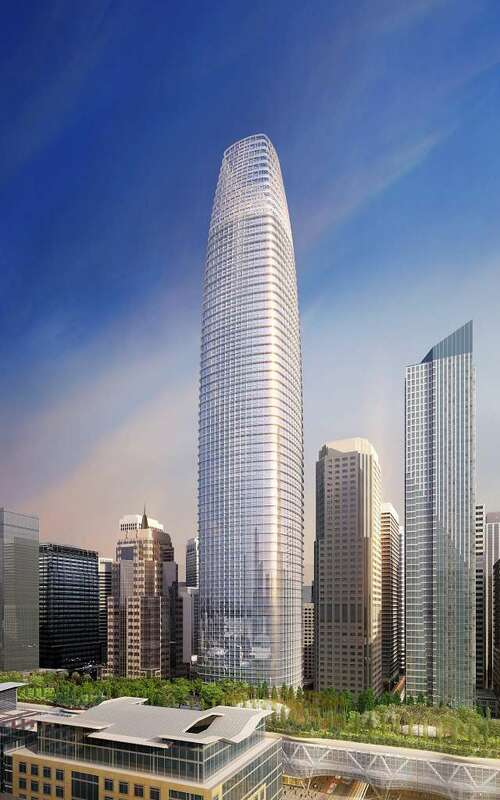 Revised Transbay Tower with lower height, but taller crown. At this scale I can't tell the height difference or is the crown height change tricking me into thinking the building is the same height in spite of the 130 foot shorter total height? So at least the Transbay Tower has played a trick – by increasing its "crown" height from 127 feet to 150 feet in spite of reducing the overall height by 130 feet. Is this a trick to make the tower look just as tall as before or is it just a concession as has been mentioned to concerns over shadows since the crown will allow much more light to pass through? Who knows. I won't be commenting on the new "slit" being added to the crown. All explanations I've heard sound like architecture smoke screen for "Oh no, the building looks weird and squat now that it's shorter, so add a slit." or "Oh no, you guys in San Francisco all realized the building is a virtual copy of Hong Kong's Two IFC Tower. Transbay Tower (renamed Salesforce Tower) before and after the slit was added to the crown. Glass Tower (aka Towering Inferno) on center right and fictitious neighbor building (center left). 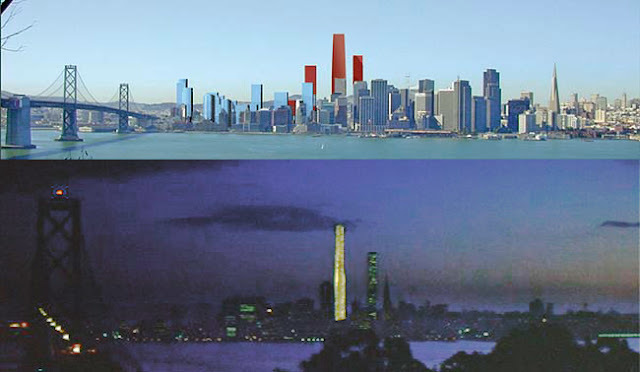 Comparison of SF Planning Dept modeling of Transbay Tower and surrounding towers and the Glass Tower from the film. Both images from Treasure/Yerba Buena Island. Great post. Thanks! People talk about buildings "blocking the view" but IMO buildings ARE the view!